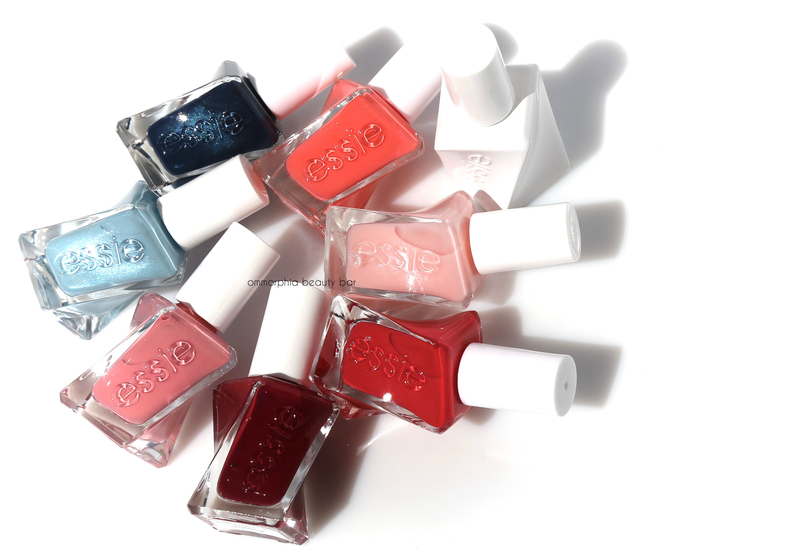 Taking things up a notch in the nail lacquer game, Essie has just launched Gel Couture, a new range of polishes (42 shades in total) that draw inspiration from the fashion industry and are ready to take you from ‘the atelier to the after-party‘. The first thing you’ll notice is the bottle with its unique twisty shape, a feature that is not only visually exciting but created to fit ergonomically in the palm of your hand (honestly, it’s such a ridiculously comfortable fit; makes you wonder how no one had already thought of it). The other innovation is the patent-pending swirl-stem brush, designed so that the polish flows smoothly down to the brush, without any nasty blobs coming down to spoil the party. For anyone who’s ever complained about the tiny size of Essie’s brushes, you can now rejoice: joining the ranks of some of my all-time favourite polish brushes (such as Dior, Guerlain and the new L’Oréal Vernis à L’Huile) the brush in this range has been given an upgrade as well. Wider than before and with rounded yet tapered bristles that splay perfectly along the nail, you need very little pressure to apply product evenly and effectively, making the job so much easier than before. Sheer Fantasy | (Atelier) Sheerest baby pink with a hybrid crème-jelly formula that is definitely not meant to be opaque. Glossy, self-levelling and non-patchy, this is the perfect ‘palate cleanser’, and while I actually love the translucent effect at 2 coats, I gave it a third layer here to show the effect. Stitch By Stitch | (Atelier) A soft bubblegum pink crème hue that applies in a buttery smooth way, showing good flow & coverage that leaves behind a glossy finish. Easy-peasy & oh-so-pretty, no? First View | (Atelier) Cool-leaning baby blue filled with ultra refined prismatic shimmer, in a crème based formula that applies like a dream: even, excellent coverage and glossy at the finish. On The List | (Fashion Show) A unique soft/hot coral hue in a crème-jelly hybrid formula that is pushing all the right buttons for me. Self-levelling, non-patchy, major colour saturation AND non-staining; this is DEFINITELY the epitome of what a Summer shade should be. Not to mention so much easier (and classier) to wear than neon. LOVE. Beauty Marked | (Fashion Show) A blue-based (cool-leaning) deep cerise red hue in a crème-jelly hybrid formula that has insane colour saturation, flow and coverage even with the very first coat. Self-levelling and über-glossy, it’s also relatively non-staining (for such an intense red), although I’d still suggest a base coat for those with porous nails. Gala-Canting | (After Party) A deep berry/maroon hue in a crème formula that has hints of a jelly finish, making it not only self-levelling in application, but coming to a glossy finish as well. 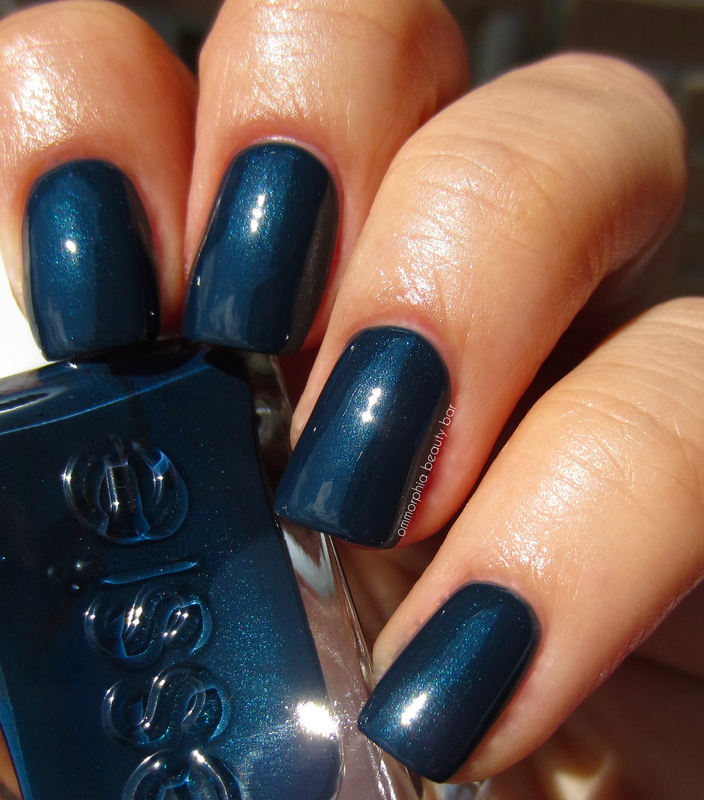 Beautiful flow & coverage, as well as non-staining upon removal, this shade makes nails look so elegant. 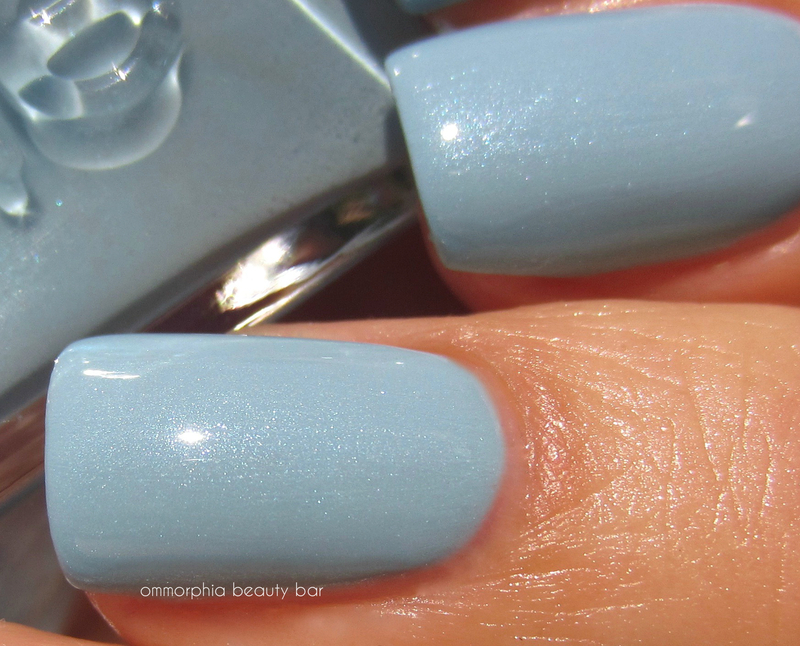 BONUS: cloud reflections seen on my nails…proves how crazy glossy these shades are. Surrounded By Studs | (After Party) A deep navy that’s chock-full of ultra fine blue & teal shimmer, giving this shade depth and a unique new vibrancy. Self-levelling and with a perfect density-flow-to-coverage ratio, you also have the added bonus of it being non-staining upon removal. Pretty stunning, wouldn’t you agree? Plus it’s edgy without coming off as just plain old black….so much love. Summed up: every single one of the shades I’ve tried thus far (I have several more in the works to show you) are nothing short of amazing. 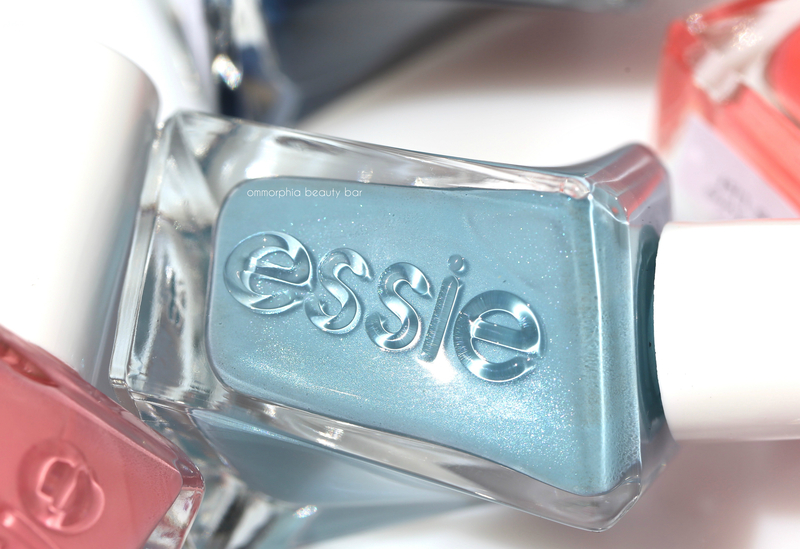 Essie has absolutely killed it with this new Gel Couture range and I have nothing but the best things to say about these lacquers. 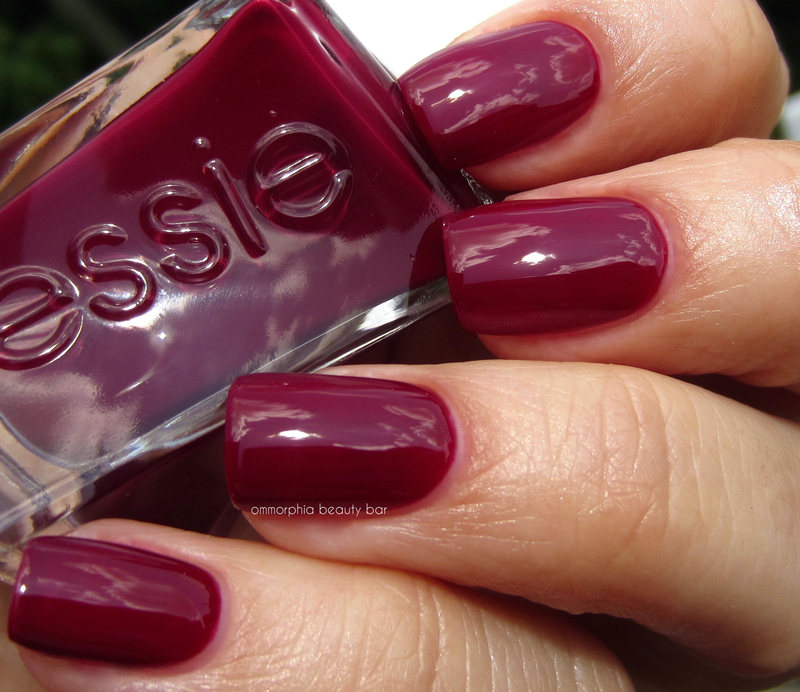 From the easy-to-hold bottle to the perfect way the brush fans out across the nail, I’ll agree with my colleague Karen who now calls these “yessie” (PS: check out her amazing swatches of the entire range here – plenty to drool over). Do you know where I can find this in Ontario? 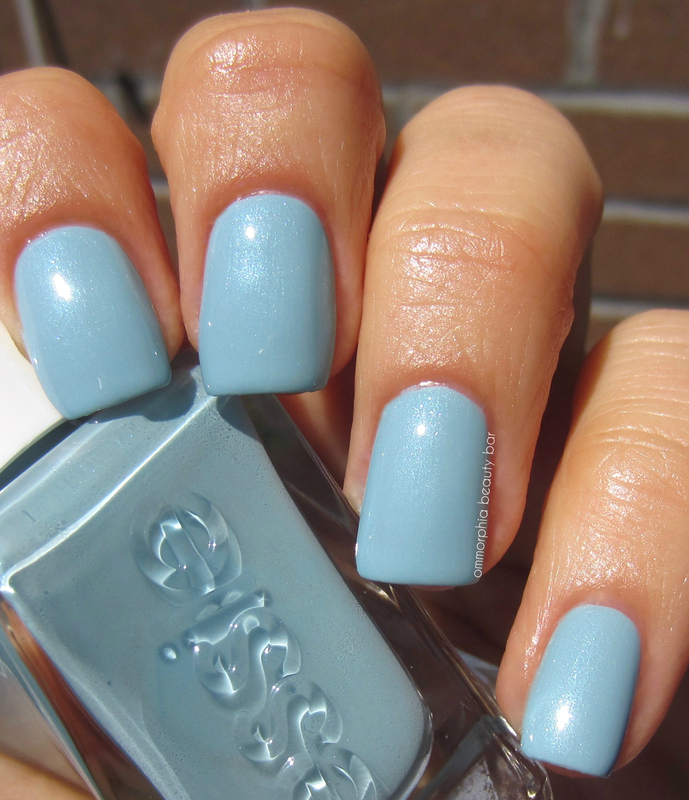 They always sell Essie products at Shoppers but I have tried a few locations with no luck so far. 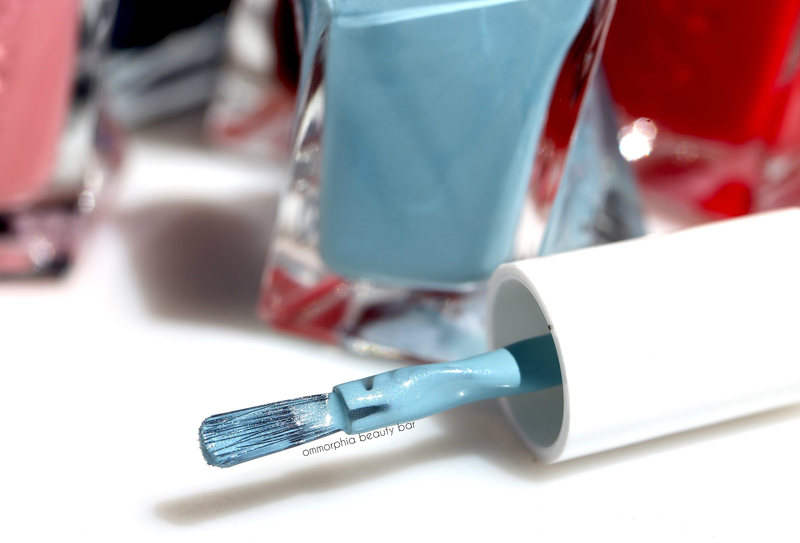 Have you tried these without the top coat to see if they definitely last longer with the top coat? I tried one shade with a different top coat and wear time was quite good, but with the matching top coat life is extended even longer; I’m actually wearing a couple of the shades now on holiday and almost 1 week in I only see very little tip wear! Thanks for the love, GF! Oooh Stitch By Stitch and Surrounded By Studs are my picks. Thanks for the swatches!